It wasn’t Martina, aged 13, who was looking for an accordion, but it was her brother’s little Hohner piano-accordion, which, feeling rather untouched, found her and wouldn’t let go of her. After finishing her degree in education in 1985 she spent a year touring her native Germany with a devised musical before appearing in the Kölner Stunksitzung. In 1986 she went to Paris to study theatre with Philippe Gaulier. During this time the accordion proved itself crucial. Busking over- and underground in Paris paid the bills and led to more interesting musical theatre work. Meeting an Englishman in Paris brought Martina finally to London where she has lived and worked since 1991 as a freelance musician, performer, composer and workshop leader. She has worked for many companies and organisations including: théâtre sans frontières, Greencandle Dance Company, the New Factory of the Eccentric Actor, Shared Experience, Music in Hospitals, ENO Baylis and Stanley Hall Opera. 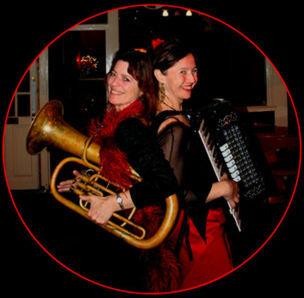 Apart from playing with Sally in Bow and Bellows Martina also performs in other bands, plays solo and teaches the accordion. Being also a song writer Martina’s songbook and CD “Hey, hey hallo! Learn German with songs” has recently been published by the Goethe Institute London. She is currently touring these songs in English, Scottish and Irish primary schools. Martina has just finished composing for the cinematic documentary film “Die Konspirantinnen” (Women Conspirators), commissioned by ICON Film, Cologne; a film about the Warsaw uprising in 1944. After completing her dance training, Sally toured the theatres and streets of Britain and Europe with a string of theatre companies from ‘Sheer Madness’ to ‘Cunning Stunts’, always with her violin at her side. She sang from birth, played recorder from 6, learned violin and piano from 10 and picked up the horn at 26 when the entire company of women she was working with decided to learn loud instruments. It was also about this time that she became enlightened as to the notion that she, along with most of the world, sang with the ‘natural voice’. From being an instrument-playing acrobat she progressed to being the musical director for award-winning Green Candle Dance Company for 10 years composing the scores for 12 of their shows, undertaking commissions for several other theatre companies and moonlighting to take a masters degree in ethnomusicology and composition. As well as performing with Martina and other bands, she now directs the Wing It Singers in Hackney, an acapella choir specializing in Eastern European songs, co-directs Maspindzeli, the London Georgian Choir, is an advisory teacher for The Voices Foundation and she also composes.